Published by the American Academy of Orthopaedic Surgeons (AAOS), this authoritative and multi-disciplinary reference helps guide practitioners to confidently evaluate and treat more than 300 complaints and conditions. Offers stepwise instruction, comprehensive coverage, and an unparalleled collection of videos and exercises. Written and edited by a multi-specialty team, including orthopaedists, physical therapists, and pediatricians including contributors from the American Academy of Pediatrics. Endorsed by the American College of Emergency Physicians, this widely used and highly regarded textbook covers the broad scope of emergency medicine. Features a format that is well-organized and comprehensive yet easy to read. Includes sections on toxicology, environmental injuries, disaster preparedness, radiation injuries, blast and crush injuries, and chemical disasters. Written as a field guide to the recognition of skin disorders and their management, this text features over 1080 full color images covering the entire spectrum of skin problems. It also includes an overview of epidemiology and pathophysiology with detailed information on diagnosis and treatment. The book is color-coded in 4 parts with helpful icons denoting the incidence and morbidity of disease. 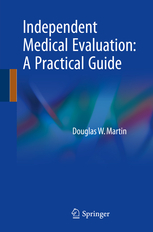 Geared toward any physician working with IME's, this book offers thorough coverage of every aspect of Independent Medical Evaluations from defining IME product and the IME evaluator themselves, explaining the medicolegal systems, and providing guidance towards establishing these professional services. Includes descriptions of how to best use medical records and best-practices for taking an IME history and conducting an examination. Chapters go on to cover developing an IME report, the common challenges and pitfalls encountered, along with strategies and pearls.